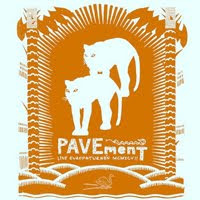 For Record Store Day 2009, Matador pressed up 2500 copies of this, another live show from Pavement in 1997. The cover was the same as the one from the previous year (though a different color), but the back of the sleeve on this one contained a bit more text (but not much more information). As usual, I was late to get out of the house for Record Store Day, but I still managed to snag one of these - the last one on the shelf at ol' Jackpot! Records. I got lucky. This is of the same era (duh) as the one that preceded it, but it's not from the same show. Still, there's a handful of songs that appear on both. But, it's a different show, the songs have slightly different vibes, and you could give me recordings of every show from the tour and I'd be happy. And again: vinyl-only, limited edition, Pavement. These are all things that make me happy. Now I just have to get that limited edition version of their greatest hits that they put out this year for Record Store Day... eBay prices are going down. I've just gotta bide my time a little longer. I can do it.